*The links and pictures can provide general guidelines only. They may not be applicable to your child. Please contact your child's healthcare team for individualized treatment recommendations. **All links and pictures are given to show examples of the adaptive equipment that children with SMA can benefit from. These examples are not recommendations! Your physical and occupational therapists can help your child maximize their independence with functional mobility and engagement with activities of daily living. The role of exercise in spinal muscular atrophy is to assist in improving flexibility, function, independence and quality of life. Limited evidence supports traditional strength training. Children with SMAcan exercise by practicing the movements and tasks they want to perform throughout the day. We call this type of practice functional exercise. It can consist of any movement or position one would like to strengthen in order to improve their activities of daily living, for example rolling, reaching, sitting and maybe even walking. These activities are dependent on age, amount of neuromuscular involvement, and developmental stage. Although exercise is important, excessive exercising may cause over fatigue and damage. Check with your physical and occupational therapists to ensure you are performing appropriate types of exercise. Range of motion (ROM) is the amount of movement in our joints. We maintain our ROM though stretching and exercise. If we do not move our joints throughout their full range of motion, our muscles and other soft tissues may get "tight". This tightness can become permanent and limit movement. We call this a contracture. Contractures, which prevent normal movement, can cause discomfort, decreased mobility, and impaired flexibility of the associated body part. Children with SMA may be too weak to move their joints throughout their full range of motion. This puts children with SMA at high risk for contracture development. Ask your therapists to demonstrate and teach you appropriate exercises. The use of splints and braces might be recommended to maintain joint alignment and prevent tightness and contractures. Weightbearing can be important for the health of our bones and muscles. Assuming a position that puts weight through our bones, such as standing, may improve bone strength, respiratory and bowel function. This is even true for children who are unable to bear weight independently. 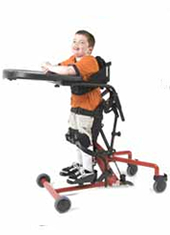 These children can be helped into a standing position through the use of a standing device. There are several different types and brands of standers. Some standers are made for children to lie on their belly (prone position), whereas others have children lie on their backs (supine). Supine standers are recommended for children without adequate head control. In addition to the weight bearing benefits, standers often allow children to be on eye level with their peers, which has psychosocial advantages.Some standers can accommodate for the development of tightness in the leg by transitioning from sitting to standing to position. Many assistive devices exist to help an individual with SMA to be mobile. In order to determine which assistive device is most appropriate, one must consider the individual's size, amount of assistance needed, and space available in the home and at school. For children who are able to walk when given external support, the use of assistive devices may improve their ability to with less dependence from their caregivers. Walkers can provide balance and arm support. Children with SMA typically use a walker with wheels (rolling walker) to assist them with their mobility. The type of walker can be anterior or posterior. A gait trainer can provide some bodyweight support with assisted walking. Your therapists can assist with deciding on the appropriate type of walker for your child. Orthotics are devices that support and align the foot. Devices vary depending on the amount of support a child needs. Children with SMA may use a SMO (supramalleolarorthosis) or an AFO (ankle-footorthosis). These braces are both lightweight plastic designs that fit inside a shoe and help maintain foot alignment while your child is standing or walking. Orthotics are typically custom-fit and can be modified as the child grows and/ or progresses. KAFO (knee-ankle-foot orthosis), HKAFO (hip-knee-ankle-foot orthosis), and RGO (reciprocating gait orthosis) can be used to help with optimal positioning and alignment in standing. In the simplest definition, a wheelchair is a mobile chair. There are many types and brands available. Wheelchairs can either be manual or power. Manual chairs can be manipulated by the individual in the chair or pushed by a caregiver. Power chairs are wheelchairs that are controlled electronically, typically by a joystick. Most commonly this joystick/control panel is located near the child's dominant hand, however if muscle strength or control is an issue, joystick placement can be modified. Powerchairs may offer children, who cannot manipulate their chair with their arms, the ability to move without help from others. Power mobility can be instituted as early as 18 months of age. Adaptive tricycles may give your child the freedom to move and engage in age appropriate play activities with peers. It can also be used as a fun form of exercise! When in the water, your body feels lighter and easier to move. The buoyancy of the water is responsible for this. Being in a pool may help to relieve pressure on the joints and makes it easier to perform exercises. This makes watertherapy especially beneficial to children with SMA. Your child may be able to move their arms and legs through greater ranges of motion and more often when placed in the water. Orthopedic issues refer to the state of our bones and the associated muscles, ligaments and other soft tissue. Maintaining proper alignment and muscle balance helps us avoid problems in this area. Children with SMA, who may be unable to maintain good alignment and/or who have difficulty moving, may be at risk for certain orthopedic issues. One of the most common concerns is spinal alignment. A curved spine affects our comfort, ability to balance ourselves in sitting and standing, our arm function, and, most importantly, can affect our breathing. If an individual does develop a side-to-side curvature of the spine, it is referred to as scoliosis. The spine of an individual who has scoliosis may look like a "C" or an "S", instead of being straight. Scoliosis may develop in children who are wheelchair bound due to weakness of the muscles supporting the spinal column. Scoliosis is slowly progressive in SMA, and needs to be followed periodically. Doctors will follow this with a physical examination or may ask to obtain x-rays. There are two ways to help. The first is positional curve control. This is any means that puts the spine into better alignment. This can be done with either wheelchair modifications (positioning devices) or bracing with a spinal orthosis to help the child maintain a straight sitting posture. The wheelchair modifications mentioned above can range from a simple lateral support that promotes upright sitting to custom molded back support that fits your child's body exactly. These positional curve controls may improve function, independence, comfort and quality of life. However, since they can typically not prevent progression, they should not be used if they cause discomfort. Many surgical techniques exist to correct scoliosis. The purpose may be to correct the curve and stabilize the spine. A consultation with an orthopedic doctor is recommended. Hip surgery is usually not needed in non-ambulatory SMA patients. Other orthopedic concerns can be due to joint contractures. Tendon release is typically not needed unless it can improve function, e.g. allow for the use of a standing device. Range of motions exercises and positioning (e.g. night splints) may assist your child in preventing joint discomfort and malalignment. Cure SMA has created a detailed orthopedic/musculoskeletal care booklet series (pdf). Respiratory care is often a central focus in the medical management of SMA. Intercostal muscles (muscles supporting the chest wall) may be weak leaving the diaphragm as the primarily breathing muscle. This may lead to decreased respiratory function with lung underdevelopment and difficulty in coughing and clearing secretions. This has the potential to cause recurrent chest infections. The breathing function can be assessed by pulmonary function testing in children over 5 years. They are asked to blow into a tube that measures their lung capacity. Chest physical therapy may be used to assist your child in clearing secretions. It often includes position changes that allow gravity to help mobilize secretions and keep lungs clear. Each of our lungs has several compartments that we call lobes. It is important to make sure secretions do not collect in these lobes. The individual can be placed in different positions to allow gravity to empty out each lobe/compartment of our lungs. This systematic change of positions promotes postural drainage. It can often be performed at home with the supervision of a therapist. A cough assist device may also be used at home to help children cough and clear their secretions. Children with SMA rely on their diaphragms to breathe. At night when they are lying down, the abdominal contents push up against the diaphragm and gravity is eliminated, making it harder to take deep breaths. This can cause our lungs to not get enough oxygen and cause carbon dioxide to build up. Children may experience daytime sleepiness or headaches from this. Doctors may help by giving a BIPAP machine, which helps the child breathe by giving extra bursts of air (intermittent positive inspiratory pressure). This assistance allows the child's breathing muscles to get a rest. If a chest infection occurs, all the above supportive care can be done at the first sign of any chest problem. Antibiotics and inhalation therapy may also be needed. Sometimes hospitalization is required to best manage and care for the child.